The Site contains message boards and other areas where you may post or upload messages or other user-generated content such as video, photos, blogs, comments, or other materials (collectively, “User Content”). You are solely responsible for all User Content you upload or post to the Site. NHHEAF does not does not control the User Content and, as such, does not guarantee the accuracy, integrity or quality of such User Content. In no event shall NHHEAF assume or have any responsibility or liability for any User Content or for any claims, damages or losses resulting from their use and/or appearance on this Site. You hereby represent and warrant that you have all necessary rights in and to all User Content you provide and all information it contains and that such User Content shall not infringe, violate or misappropriate any intellectual property or other rights of third parties or contain any libelous, tortious, or otherwise unlawful information. You acknowledge that NHHEAF may or may not pre-screen User Content, but that NHHEAF and its designees shall have the right (but not the obligation) in their sole discretion to pre-screen, refuse, or remove any User Content that is available on the Site. Without limiting the foregoing, NHHEAF and its designees shall have the right to remove any User Content that violates these Terms or is otherwise objectionable. NHHEAF does not claim ownership of any User Content you post, submit or upload to the Site. By submitting, posting or uploading User Content to the Site, you automatically and hereby grant to NHHEAF, its affiliates and subsidiaries a worldwide, royalty-free, perpetual, irrevocable, non-exclusive, transferable right and license to use, publish, perform, display, exhibit, reproduce, modify, adapt, edit, translate, create derivative works from, incorporate into other works, distribute, sublicense and otherwise exploit such User Content (in whole or in part) in any form, media or technology now known or hereafter developed. You also permit any other user to access, view, store or reproduce the User Content for that user's personal use. You agree not to upload or post any User Content that violates, infringes or misappropriates any third party’s copyright, trademark, trade secret, right of publicity or other intellectual property or proprietary right. You shall be solely liable for any damage resulting from any infringement of copyrights, trademarks, trade secrets, rights of publicity or other proprietary rights or any other harm resulting from such a submission. Any person determined by NHHEAF, in its sole discretion, to have violated the rights of others shall be barred from submitting or posting any further material on the Site. NHHEAF provides additional terms and conditions, rules and/or guidelines (“Official Rules”) for certain activities on this Site including without limitation contests and sweepstakes. These Terms are incorporated by reference to the specific Official Rule which appear in connection with information about a particular activity. To the extent that any conflict exists between these Terms and Official Rules, the Official Rules for the activity in which you choose to participate control. The Site may include, or third parties may provide, links to other websites or resources. You acknowledge and agree that NHHEAF is not responsible for the availability of such external sites or resources, and does not endorse and is not responsible or liable for any content, advertising, products or other materials on or available from such sites or resources. You further acknowledge and agree that NHHEAF shall not be responsible or liable, directly or indirectly, for any damage or loss caused or alleged to be caused by or in connection with use of or reliance on any such content, goods or services available on or through any such site or resource. The goal of the “I am College Bound” campaign is to provide New Hampshire high school students with the inspiration, information and planning support to pursue higher education goals. The Center for College Planning team especially encourages low-income students, their parents and their mentors to recognize that New Hampshire campuses and the U.S. Department of Education offer strong financial aid programs which enable eligible individuals to access financial assistance in paying for education beyond high school. To inform, engage and grow public awareness about financial aid programs, students are incentivized to share content with friends and peers within their networks through monthly promotions. Learn more about New Hampshire's “I Am College Bound/I Applied” initiative for high school seniors here. 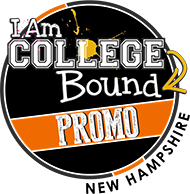 What's the April I Am College Bound Promo? Need Money for College? Think Scholarships! Okay seniors, does it seem like it’s crunch time in your college process? You are well on your way to making the decision of making your college commitment. In April, so many things happen at the same time. Financial aid offers are being reviewed, admitted student days are being scheduled, Facebook groups for your college class are being created – the list is endless. What’s the one piece that’s left? Applying for private (or “outside”) scholarships! "Outside" scholarship funding comes from various national or local organizations or charities outside of a college's financial aid program and are designed to help students manage college costs. These scholarships can help students pay tuition and other college costs like room and board, fees, books, and supplies. Students often find great success in searching locally for college scholarships. Your school’s guidance office will have the most comprehensive source for local and regional scholarships. Your high school may also have its own procedure for applying for local scholarships which you will want to ask about. And the New Hampshire Charitable Foundation (NHCF) is the largest provider of publicly available scholarships in New Hampshire, awarding over $5 million to 1,700 students each year. One key deadline for the NHCF is Friday, April 12th, when applications for their Statewide Student Aid Program for students pursuing a four-year degree are due. It is important to remember national scholarship opportunities will often have larger applicant pools – but are often larger dollar scholarships. A few of the largest databases of national scholarships include fastweb.com, collegeboard.org, petersons.com, goingmerry.com, and collegetoolkit.com. Scholarships are free money; so, find those that are good fits for you and apply to as many as you can! If you are lucky enough to receive an outside scholarship, the funds will typically be sent on your behalf directly to the college you will attend. Once you are notified you have won a scholarship, it’s your responsibility to notify your college's financial aid office to let them know and they will determine how they will treat your scholarship. In most instances, the funds will be applied directly towards your balance. At the Center for College Planning (CCP), we assist families every day in reviewing financial aid award letters and helping explain how families pay for college. Schedule a FREE one-on-one appointment with one of our college counselors today if you need help. Call us at 888.747.2382, ext. 119 to set up your appointment! Many scholarship opportunities require supporting documents. Which of the following do they require? For help answering this question, click here. Participating New Hampshire students have the chance to win one of two (2) $25 Amazon gift cards this month! I'll be the first person in my immediate family (including parents and siblings) to go to college. I'm a foster child or youth-in-care (or was until the age of 18). English is NOT the primary language spoken in my home. My parents have been saving for years. I think I'll be in a good position to pay for school without any financial aid. While my parents have some savings and make a decent living, I'll definitely still need some financial aid. I'm relieved to know that financial aid can cover most of my expenses. I don't know how I'd pay for school otherwise. Click Winners' Circle for a listing of past winners! You have entered more characters than permitted.